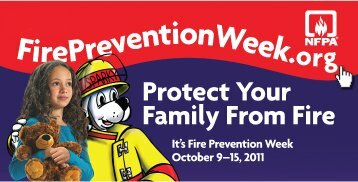 National Fire Prevention Week is October 9-15, 2011. This year the NFPA’s official theme for Fire Prevention Week is “Protect Your Family From Fire”. As per the NFPA, this year’s campaign is all about keeping you, your family, and your community safer from fire. Associated Fire Protection encourages everyone to take some time during Fire Prevention Week to review what you know about fire safety and to educate yourself on how to keep yourself, your family and your community safe. Associated Fire Protection employees are always available to answer any questions you may have. Please feel free to contact us at 973-684-4500 or visit us online at www.associatedfire.com to send us an email with any questions you may have. Visit our online store and take advantage of special sales on fire protection and home safety products.